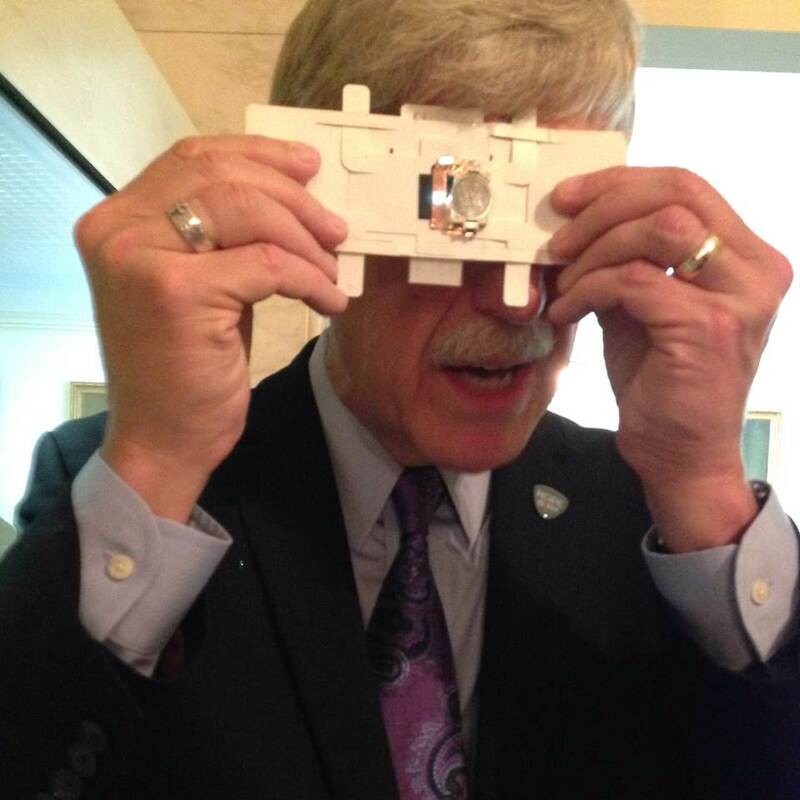 Caption: Here I am checking out the Foldscope at the White House Maker Faire on June 18. Very cool! When Stanford University bioengineer Manu Prakash traveled to a mosquito-infested rainforest in Thailand a couple of years ago, he visited a clinic with a sophisticated, $100,000 microscope that sat unused in a locked room. It was then Prakash realized that what global health workers really need is an ultra-low cost, simple-to-use, portable microscope that could be deployed in the field to diagnose disease—and he took it upon himself to develop one! The result is the Foldscope, a ‘use and throwaway’ microscope that Prakash demonstrated last week at the first-ever Maker Faire at the White House. While I saw many amazing inventions and met many incredible inventors at this event, I came away particularly impressed by the practicality of this device and the ingenuity of its maker. Here’s what you need to know about the Foldscope. It’s made out of thick, waterproof paper and a glass-and-polymer lens that’s the size of a large grain of sand. While it can be used by simply holding the device up to the sun or a light bulb, there’s also a version illuminated by tiny LEDs powered by an inexpensive watch battery. The framework of the Foldscope is printed onto a sheet of paper that’s perforated in a way that each shape can be easily snapped out and folded in a manner resembling the traditional Japanese art of origami. A diagram showing how to assemble the Foldscope is even included on the sheet, and can be understood by anyone, regardless of their native language. Different designs, folding patterns, and types and numbers of lenses create different types of microscopes: bright field, dark field, fluorescence, and lens-array. A low-magnification microscope costs as little as 50 cents, while a high-mag version is just shy of a dollar. So, how do you use the Foldscope? It turns out that this bookmark-size device uses the same glass slides that one uses in a regular microscope. So, the preparation of blood or tissue samples remain the same. In the simplest version of the scope, the slide is inserted between the microscope’s paper layers and the user, with a thumb and forefinger grasping either end of the microscope strip, holds the lens close to one eye and flexes the strip to find the target object and bring it into focus. I had the chance to try this at the White House event, and found that learning how to use it is very easy. In more advanced versions, the device can project the image onto a wall or any other flat surface—a great, low-cost tool for educating healthcare workers and others in low-income nations about various infectious diseases. Prakash is currently fine-tuning Foldscopes so they can be field tested in Ghana, Uganda, Nigeria, and Peru for diagnosis of malaria, microfilariasis, leishmaniasis, schistosomiasis, and sleeping sickness. His team at Stanford is also busy designing Foldscopes to help diagnose 30 other diseases, and drawing up plans for a next generation of Foldscopes that will utilize microfluidic components rather than glass slides—a step that should make sample collection and analysis even easier. Not only will Foldscope give healthcare workers around the globe better ways to detect, and thereby treat, disease, it will also place magnifying power within the reach of all the world’s students, enabling them to ask and answer a great many scientific questions. To this end, Prakash has launched the Ten Thousand Microscopes Project to entice inquiring minds to beta test these devices and design experiments that can then be compiled into a crowd-sourced microscopy text. 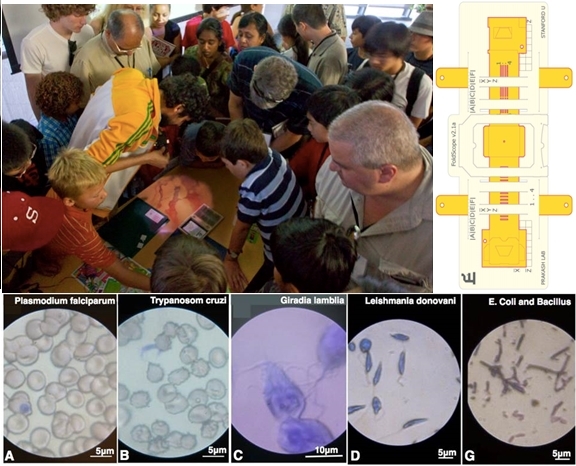 Imagine a world in which every kid carries around a 50-cent portable microscope, and brings science out of the lab and into real-world biology. Already 10,000 citizen scientists from 130 countries have answered the call. Among the ideas: a proposal from a Mongolian farmer who wants to use Foldscope to detect potential pathogens in camel milk. Think about it – what would you do if you had one of these in your pocket? Caption: Clockwise from upper left, Foldscope projecting a magnified image onto a table; a diagram of an assembled Foldscope; magnified images of disease-causing microbes as seen through a Foldscope. Foldscope: Origami-Based Paper Microscope. Cybulski JS, Clements J, Prakash M. PLoS One. 2014 Jun 18;9(6). Pairing lenses into origami is truly a cool idea! I am adding this to my Facebook page! This is an amazing example of how innovative technology does not need to be expensive and complex. Ease of implementation and dissemination are two elements that are invaluable in areas like translational medicine, but they are so often overlooked in the push to develop increasingly complex research designs. I hope we have these in the class room soon!! When art meets science. Love it!